Magnetic Wooden Fishing Toy Set 36% OFF with Code! ❤Hi little anglers,pick up your fishing rod, cast your line, and try to hook a colorful fish.The fishing toy includes 2*fishing rod+32*fish,Enjoy fishing while mastering the basics of life skills. Learning Basic Life Skills----Sharpens fine motor skills and reinforces taking turns through social learning,exercise eye-hand coordination ability, logical thinking ability and creativity to improve your baby's concentration. 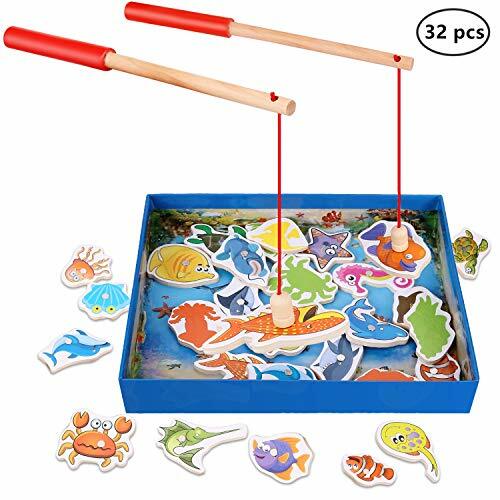 How to Play----The aim of this fishing game is to catch and count the 32 wooden fish with the aide of a magnetic rod,one person catches a fish and turns the next person. Kids Friendly----BPA Free, Lead Free, Phthalate Free. The edge carefully polished, it is very comfortable for kids's hands. 【XREXS Provide You 0% Risk Shopping Experience】-------XREXS offer 30-Days Refund Policy, 3-Months Replacement Guarantee,12-Months Warranty, buy with confidence from XREXS,your satisfaction are guaranteed. If you have any products and service problem,please feel free to contact our email--rexsllc01@gmail.com.